Indo-Russian bilateral defence collaboration appears set to move toward more joint co-production of military equipment, after India’s Defence Acquisition Council opted to build the Russian light helicopters, the Ka-226T, in India. The specific types of equipment have not been announced, it has simply been observed that these could be airplanes and helicopters, as well as ships and missiles. The Defence Acquisition Council (DAC), chaired by India’s defence minister Manohar Parrikar, chose to build, as part of the ‘Make in India’ programme, a series of light helicopters, the Ka-226T. The purchase of six supersonic BrahMos cruise missiles has also been approved for the Indian Navy, and will be jointly produced by Russia and India. Bilateral defence cooperation has a long history. In 1967 the national aviation construction corporation, Hindustan Aeronautics Limited (HAL) assembled its first MiG-21 on licence from the USSR. HAL has been India’s leading aviation construction company since India’s independence. The company’s production of Soviet and then Russian MiG-21s, Mig-27s and Su-30 MKIs has played an important role in establishing the Indian air force, which, incidentally, is the fourth largest in the world (behind the USA, Russia and China). Soviet designed aircraft form the core of India’s military aviation. 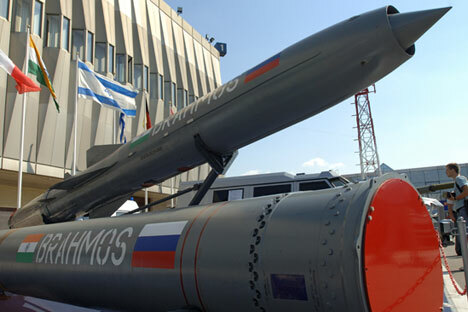 Since the end of the 1990s, another joint Russian-Indian company has been successfully producing armaments; the BrahMos Aerospace plant specializes in manufacturing BrahMos supersonic cruise missiles. The plant, located in Hyderabad, was named in honour of the Brahmaputra and Moscow rivers; its main project is the hypersonic BrahMos PJ-10 cruise missile, which was jointly developed by the Russian NPO Mashinostroyenia JSC and the Indian Defence Research Development Organization (DRDO). Assembly is carried out both in India and using the manufacturing capabilities of Orenburg company Strela. This weapon can be used from submarines, ships, land installations and also from aircraft (for example, from the Su-30MKI and even from the Il-76 using specially installed pylons). Two types of missile systems are manufactured: one is naval based and the other is for land forces. At present the missile is currently in service with the Indian Navy. The BrahMos is attracting interest on the international arms market. Another area of military-technical cooperation between the two countries could be the programme to develop a fifth generation fighter aircraft (FGFA). Recently, Parrikar said his country has already invested nearly 15 billion rupees (US $ 230 million) in the project, along with Russia. The FGFA fighter is being developed on the base of the long-range Russian T-50 aircraft. Russia and India signed an agreement to collaborate on a joint aircraft on 18 October 2007 in Moscow, at the seventh session of the Russian-Indian intergovernmental commission on military-technical cooperation. This project is the largest in the field of military-technical cooperation between the two countries. The prospects are also good for naval cooperation. At the International Maritime Defence Show in St. Petersburg, Rosoboronexport Deputy General Director Igor Sevastyanov said negotiations were continuing on possible supply of three Project 11356 frigates and Project 75I submarines to India. Russia has supplied India with a total of six Project 11356 frigates, said Sevastyanov, three in 2003-2004 and three more in 2012-2013. Joint production of the Sukhoi superjet, a short haul passenger plane, may begin in India, Dmitry Rogozin, Russian Deputy Prime Minister said last year, concluding a meeting of the Russian-Indian Intergovernmental Commission on Trade, Economic, Scientific, Technical and Cultural Cooperation. Rogozin said the superjet could be produced for India as well as for joint access to markets of other countries. According to Rogozin, Russia and India could also establish joint production for modules to receive signals from the GLONASS satellite system. “Relations between India and Russia have always been characterized by many years of friendship and mutual trust,” said P.S.Raghavan, Indian Ambassador to Russia, in a recent interview with Russian media. “Russia is an important strategic partner to India and will continue to remain so.